The children have had a great term and have worked hard to improve their writing, social skills, maths and understanding. They deserve some Christmas fun and I do hope Santa brings you all something nice this year! 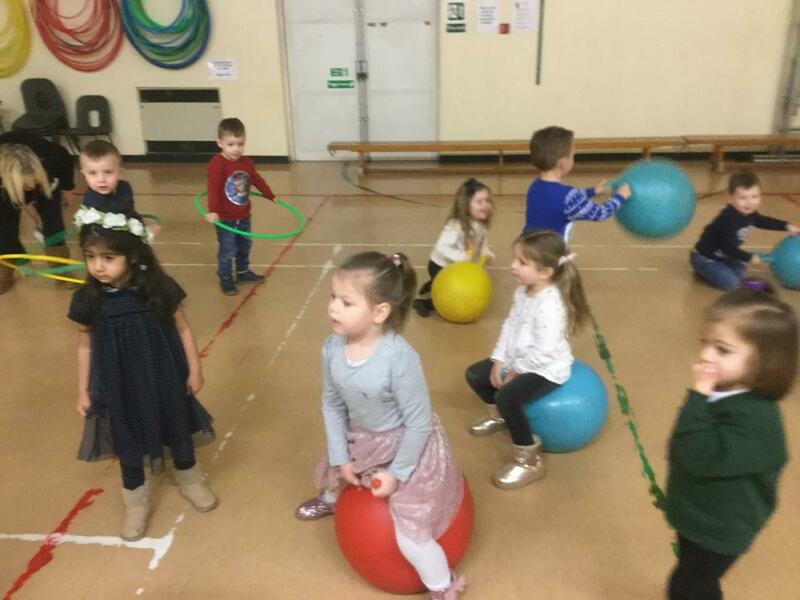 We have a busy term ahead of us and we will have a trainee teacher coming into class called Mrs Fullard in January so please help welcome her to our team. 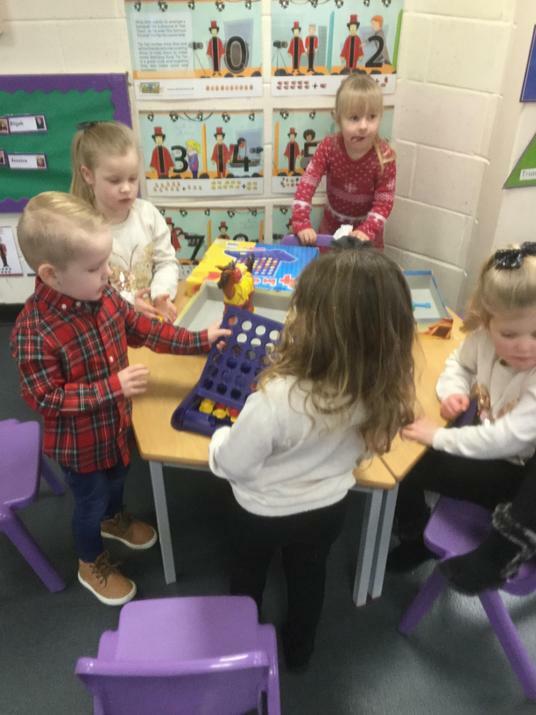 From Nursery staff at Waverley "Have a very Merry Christmas and a Happy New Year". 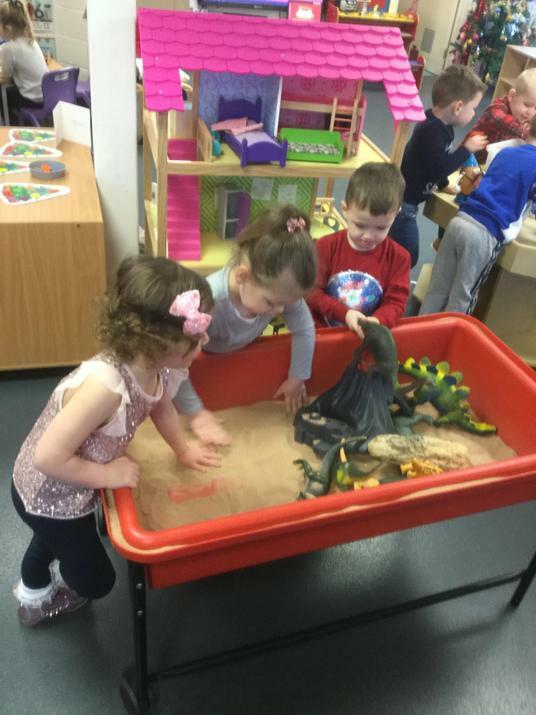 Take a look at our last week. This week has once again been jam packed. We had our very first Christmas Nativity and I think you will agree when I say the children were extremely brave and sang their hearts out. Thank you to one and all for coming to watch. 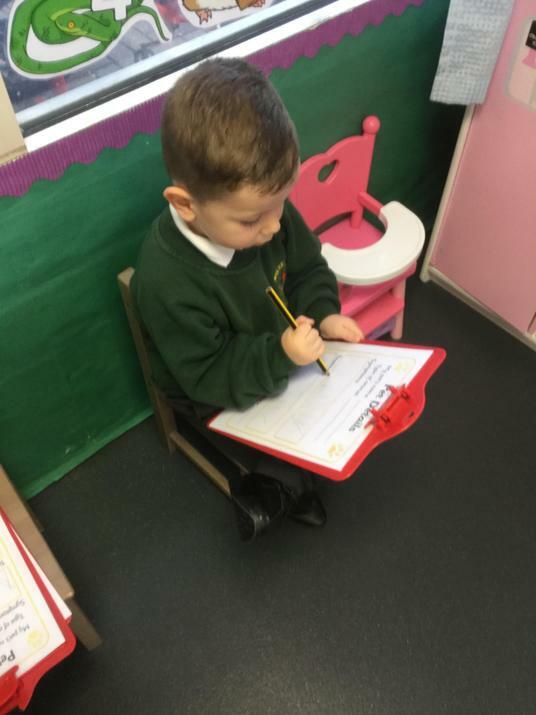 We have also blown our socks off with our writing this week. We have been developing our letter formation and phonic sounds recognition with our Christmas initial sounds and learning how to write the word hat for Santa hat that he lost when collecting Nurserys Christmas wish lists. The children have also enjoyed reading lots of Christmas stories such as the Night Before Christmas, Norman the slug who saved Christmas, A Selfie Christmas, The Gruffalos child and that is only to name a few. 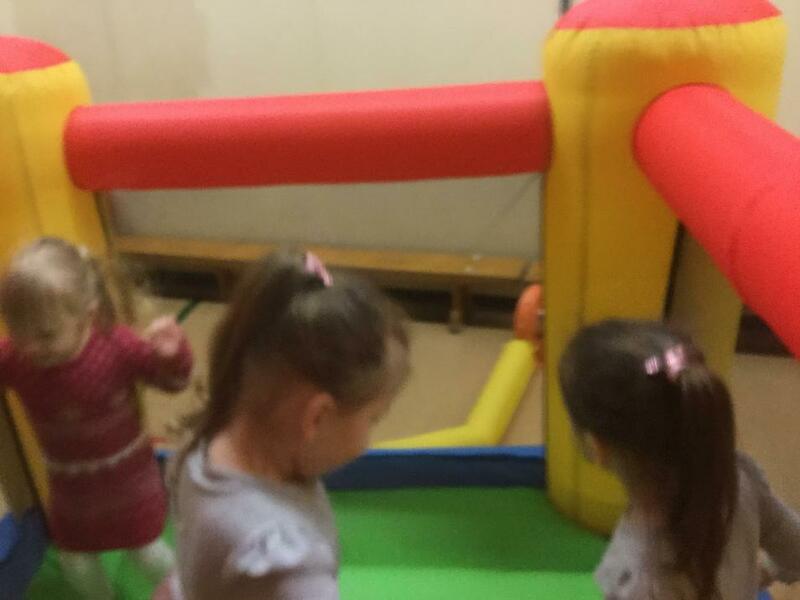 Please remember its the Nursery Christmas Party on Wednesday so come dressed to impress. 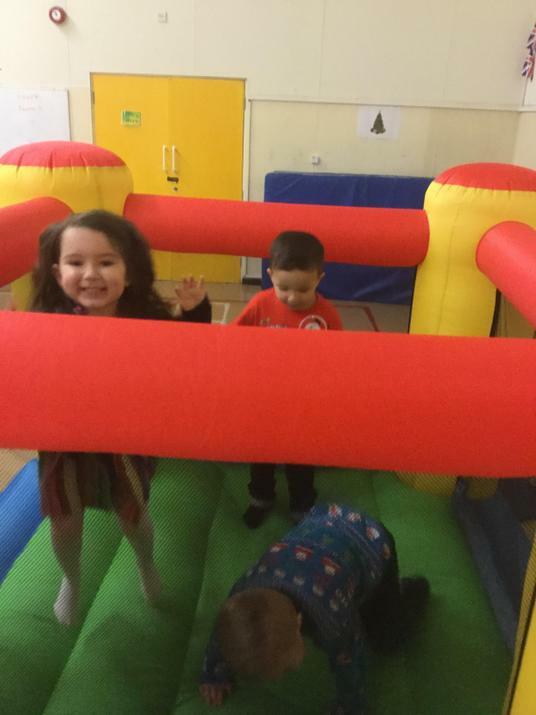 We will have party games, disco and juice and cakes provided by myself so no need to bring in party food. Please take a look below at our new writing wall showcasing all of our improved writing skills. We would like to say a huge thank you to all of the parents and Grandparents that came to support your children in our Christmas craft Day. 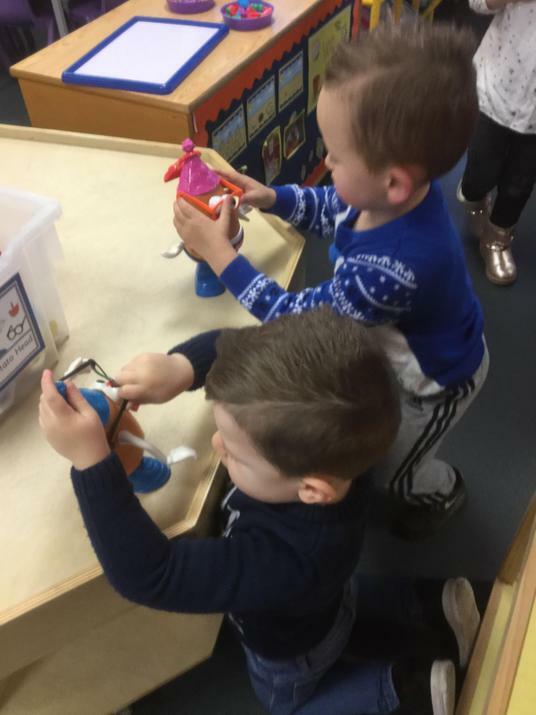 We had fun making lots of Christmas craft such as Reindeer dust to sprinkle outside on Christmas Eve, Reindeer chocolates, clay models of Rudolph, Christmas Crackers, Baubles, Elf Masks and much more. 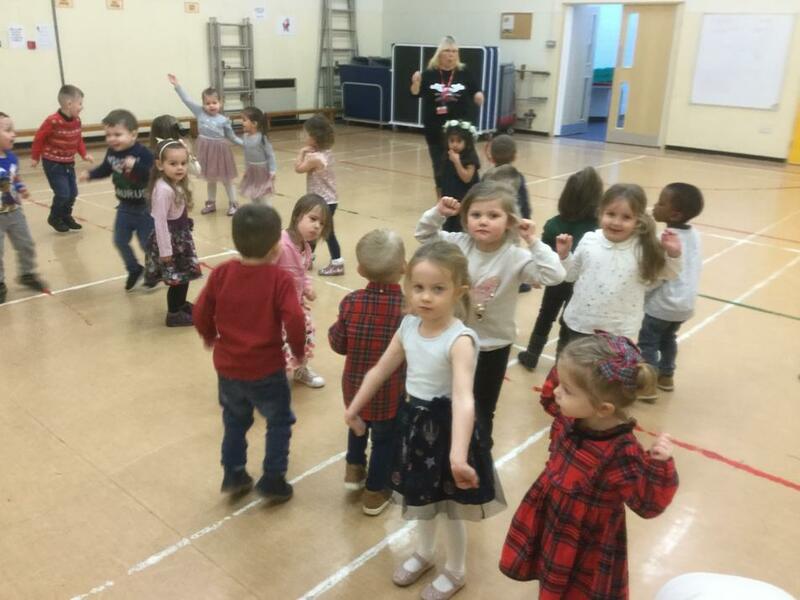 Nursery have been learning the songs to our Nativity. We look forward to singing them to you on Wednesday. This week we have developed our understanding of a narrative. We are now learning how to discuss a story in order saying what happened first, next and then. We are now able to talk about the main charachters in our story and we can join in with some repeated refrains "run run as fast as you can you can't catch me Im the Gingerbread Man"
We have also developed our baking skills and we have made our very own Gingerbread men. 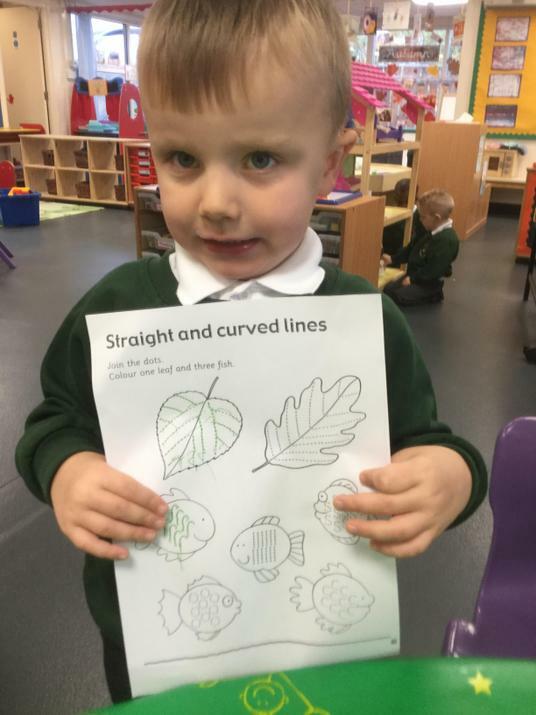 The children started to learn all about Traditional Tales. 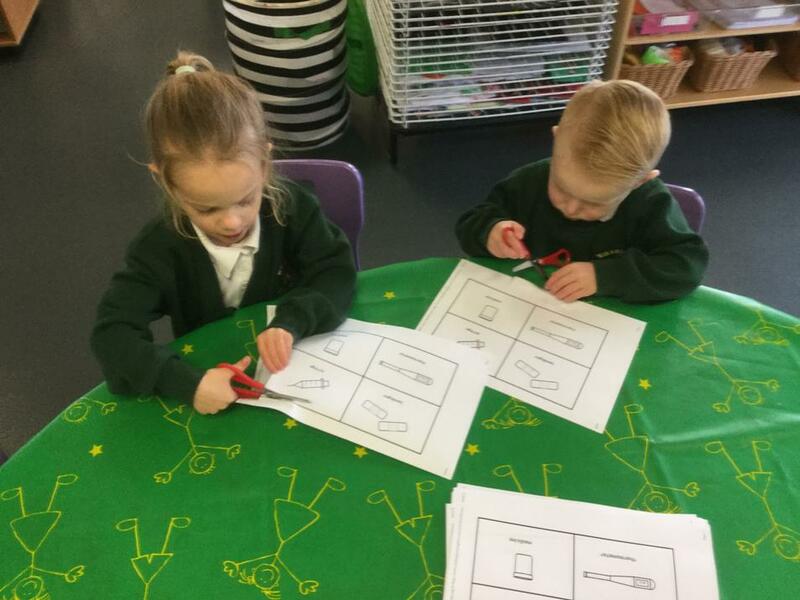 We have been focusing this week on the story of The Gingerbread Man. 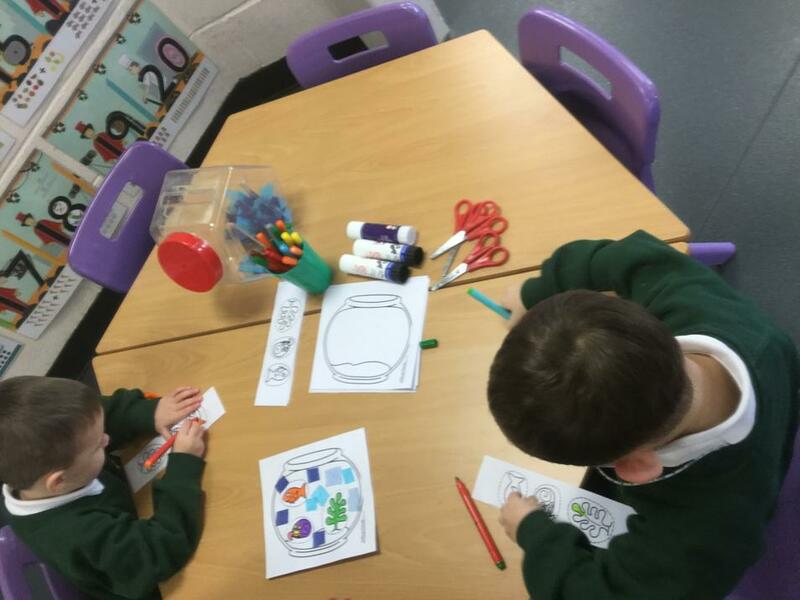 We have been learning about main charachters, story plots, who, where and when questions and we have been designing our very own Gingerbread men. 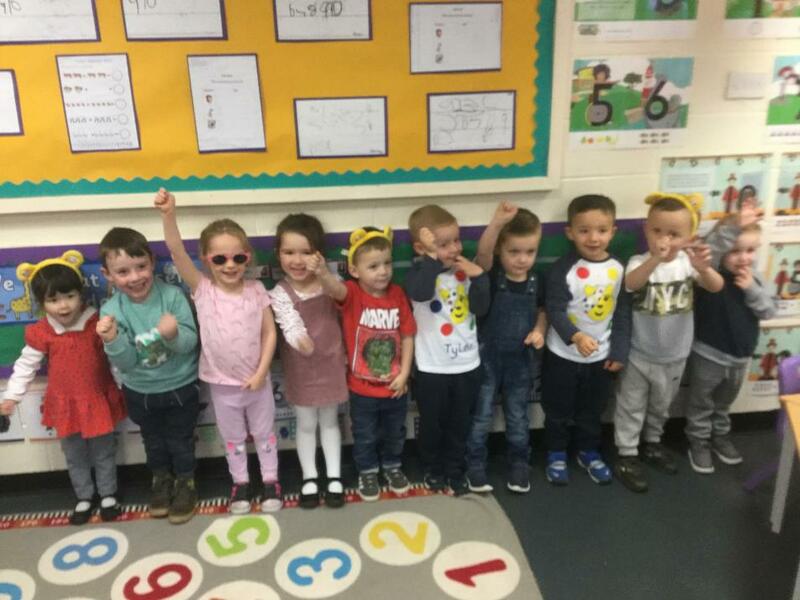 This week we have celebrated Children In Need. The children came dressed to impress and donated money to a very worthy cause. We watch Pudsey talk about what Children in Need is for, we made masks, cards and coloured him and Blush in. 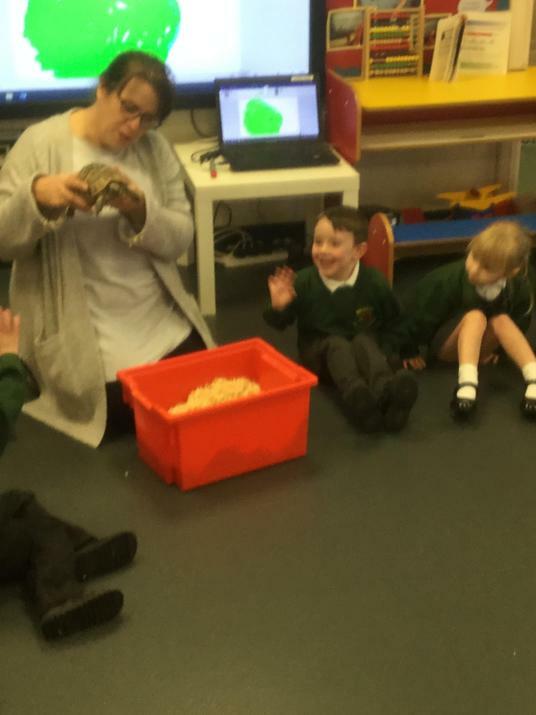 We also had a star attraction in our class Holly the Tortoise. 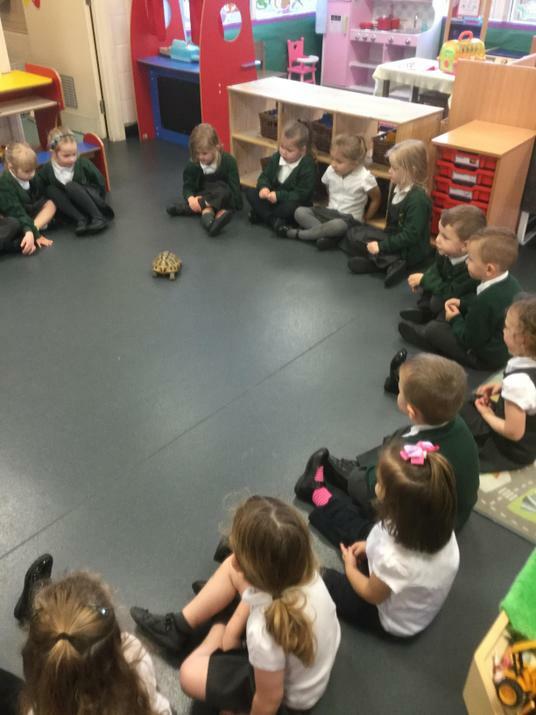 We learnt about how she moves, what she likes to eat, what her main features were; shell, claws, beak, soft body, scales. The children loved watching her move and asked questions about where she lives and what she eats. They all listened well and were calm for her visit. Next week we start our topic: The Gingerbread Man where we will look at Traditional Tales. We have been watching my pet and me to learn about features of household pets, how to care for them, and what they look like. 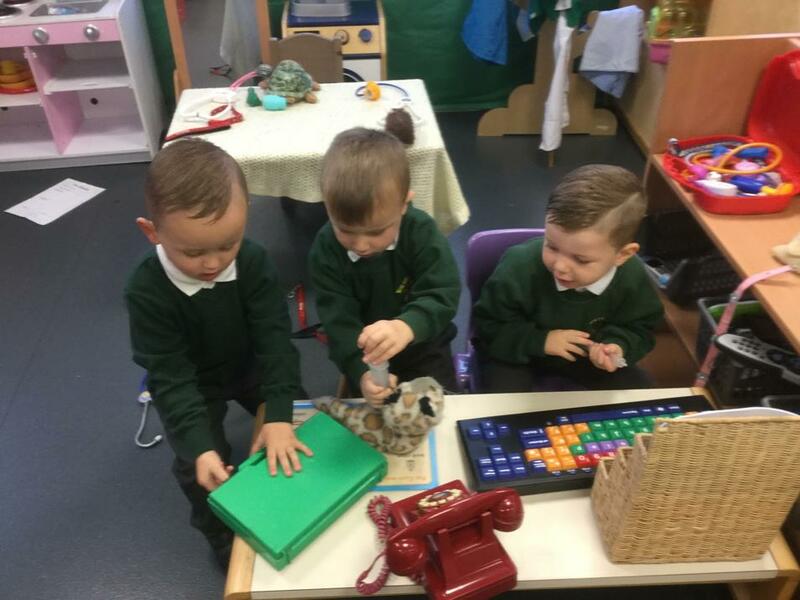 The children enjoyed learning about the rabbit so far. We have developed our understanding of cats through a labeling activity. 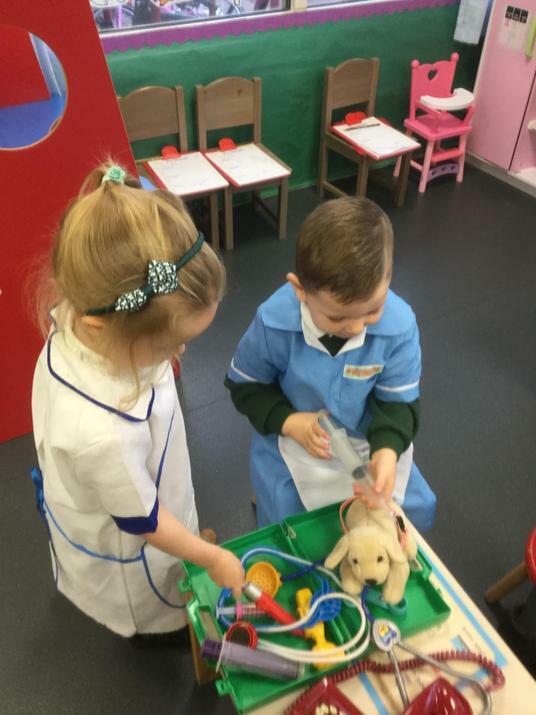 We have made hanging birds in a cage, cut out key medical equipment for our vets bags and have been making our animals better in the Vets corner. 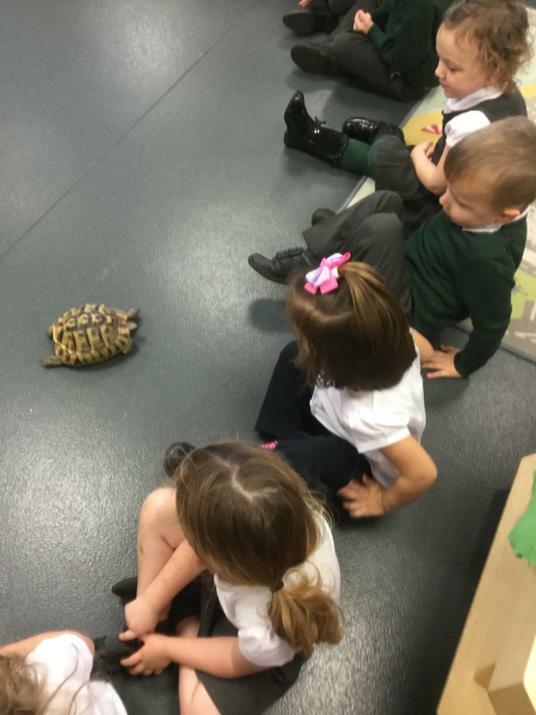 Next week we will be meeting Mrs Brickwoods pet Tortoise Holly. stay tuned for her visit.